Dental implants are the strongest, most lifelike and longest-lasting replacement option for missing teeth or teeth that are in need of extraction. Due to their superior characteristics, exceeding any other form of tooth replacement, Dr. Davidson recommends them as the first and best choice for all patients who are eligible to receive them. A dental implant is a titanium post that is inserted into the jaw to act as a replacement for a missing natural tooth root. A connecting piece, known as an abutment, is placed on top of the implant and functions as the attachment point for a dental restoration such a crown, bridge or denture. After the implant is placed, the surrounding bone cells grow and integrate with the surface of the implant and securely anchor it in place. The integrated implant is just as strong as a natural, healthy tooth root. Dr. Davidson is a highly trained and experienced implant dentist, and has kept up-to-date with the latest advances in dental implant treatment for over 25 years. 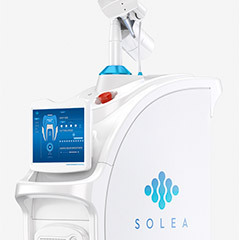 He uses state-of-the-art 3D imaging, and computerized treatment planning technology, to ensure dental implants are placed accurately, efficiently and comfortably. In addition to providing comprehensive dental implant services in his own practice, Dr. Davidson instructs other dentists in the United States and abroad on 3D imaging and dental implant procedures. For most patients, we are able to take care of the entire implant treatment process from start to finish. This includes both the placement of the implants and the design, fabrication and placement of the artificial replacement teeth. Due to major advances in technology, most people are now candidates for dental implants. In the past, patients with extensive bone loss in the area of their missing teeth were not able to receive implants, as implants need a certain amount of bone support to be stably anchored. 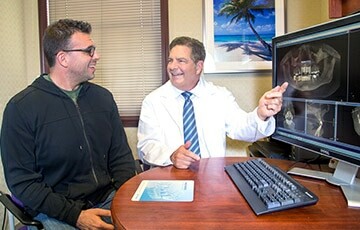 However, thanks to modern bone grafting techniques, Dr. Davidson can regenerate lost bone in many cases, so that implants can be securely placed. Even patients with health situations that formerly made implant placement too risky can now receive the benefits dental implants have to offer. This includes patients who are heavy smokers or who have major health conditions such as diabetes or cardiovascular disease. Dr. Davidson can work directly with your physician if necessary to ensure these factors do not act as a barrier to successful dental implant treatment. There are no age restrictions on who can receive dental implants, other than young people whose jaw structures have not yet fully developed. 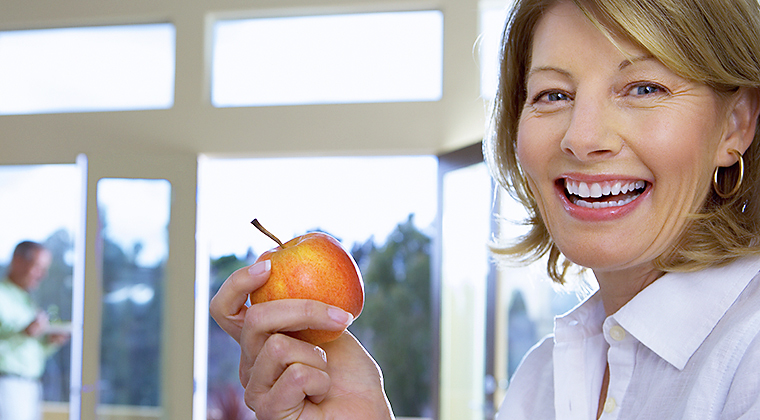 Dental-implant-supported teeth have the equivalent chewing power of natural, healthy teeth. Dental-implant-supported replacement teeth feel, function and look like natural teeth. Most patients cannot tell the difference between a tooth supported by a dental implant and a natural tooth. To replace a missing tooth with a dental implant and a crown, we do not need to grind down and weaken the adjacent teeth, as is necessary when using a dental bridge. 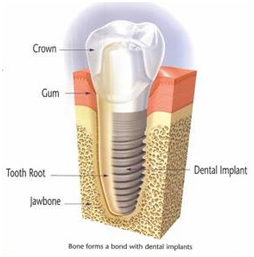 Dental implants prevent the bone loss that occurs as a natural biological process when teeth are missing. By preserving your bone, the size and shape of your jaw is maintained, which can help extend your youthful appearance. Implant-supported teeth stabilize the adjacent teeth. The gap created by a missing tooth can cause adjacent teeth to shift position and adversely affect your bite and ability to chew. Dental-implant-supported dentures are held firmly in place, need no adhesives, and provide greatly enhanced chewing power. 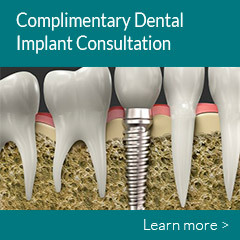 Dental implants last longer than any other tooth replacement option. With proper care, they can last a lifetime. Dental bridges have traditionally been used to replace a single missing tooth or several missing teeth in a row. However, the natural teeth on each side of the gap need to be ground down so the ends of the bridge can be cemented onto them. This weakens those teeth and can lead to decay, fracture or other complications over time. Additionally, bridges do not prevent bone loss underneath the missing teeth, and dental bridges have an average lifespan of only ten years. On the other hand, implant-supported replacement teeth do not require the compromising of healthy, adjacent teeth. Implants also transmit the required biting and chewing pressure that acts as a signal for the body to maintain the bone volume in the jaw. A dental bridge does not require surgery and is a more economical solution in the short term. 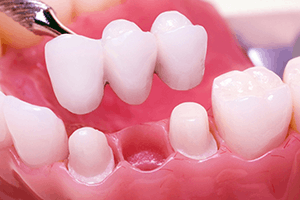 A bridge can be a suitable option in certain circumstances, such as when the adjacent teeth are already broken-down and in need of dental crowns. However, bridges will at some point need to be replaced, which means additional time in the treatment chair as well as added expense. With implants, you will usually only need to undergo treatment once, as implants can be expected to last for the rest of your life as long as they are properly maintained. Until dental implants were developed, traditional dentures were the only available solution for replacing all of your teeth. 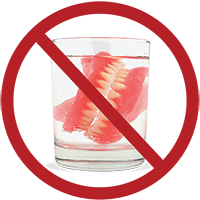 Although dentures have greatly improved over the years and are still an option, dentures have a number of disadvantages that make them a less-than-ideal solution. Dentures provide only about 10-20 percent of the chewing power of natural teeth. This makes it very difficult, if not impossible, to eat all the foods you need for proper nutrition without having to resort to a blender. Dentures can click or make noises while you eat or speak. Dentures often slip while you are chewing, which can lead to painful sores on your gums. Upper dentures have a false palate that covers the roof of your mouth. This inhibits your sense of taste and dulls any awareness of heat or cold while you eat or drink. Dentures often need messy adhesives to keep them in place. Dentures need to be removed at night to be cleaned. Due to progressive bone loss, dentures repeatedly lose their fit and have to be adjusted regularly over time. Bone loss will eventually become so severe that no denture can be made to fit well anymore. The type of pressure exerted on your jawbone by traditional dentures actually accelerates bone loss and eventually leads to a “collapsed” appearance of the lower third of your face. Wrinkles, thin lips, and a protruding chin will make you look prematurely aged. The type of pressure exerted on your jawbone by traditional dentures actually accelerates bone loss and eventually leads to a “collapsed” appearance of the lower third of your face. When a denture is supported by dental implants, the denture rests on a solid foundation. It does not slip around in your mouth and your chewing power is markedly increased. Implant-supported dentures continue to fit well over time. Additionally, the chewing pressure placed on the implants stimulates the jawbone underneath and helps maintain bone volume, thus preventing the bone loss that can lead to a “collapsed” look of the face. Dr. Davidson provides numerous options for implant-supported dentures and full-arch replacement teeth.